The Copper Scroll Project officially launched on October 31, 2018. I thought I would never see this day come but strangers are picking up the book in the airport, checking it out from the library, and adding it to their holiday wish list. The book is doing what books do and it is growing arms and legs and gaining momentum. This morning I saw that the book is officially number one in its category. 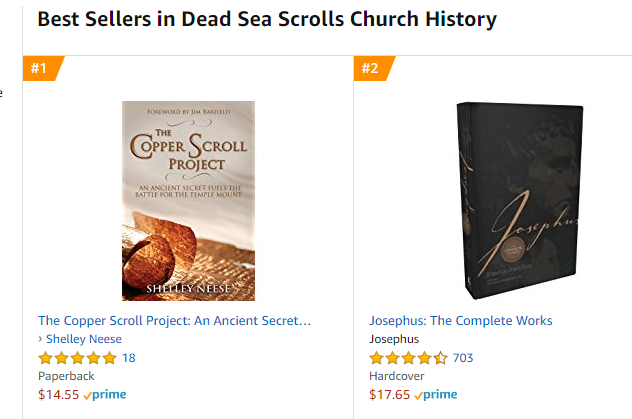 That means The Copper Scroll Project inched out Josephus, the ancient historian who has had that honored position for about 2,000 years! I have long believed that Jim Barfield’s story was one worth telling. And I feel blessed every day that I got to be the one to share it. Will you help me spread the word to your friends and family who may have a fascination with Israel, Judaism, archaeology, or just plain adventure? I aim for this book to be a teaching tool to deepen the faith of all believers and restore their hope in the Bible’s promise. Here is a one minute trailer for the book. Would you consider sharing it on your Facebook page or Twitter? I am paranoid that I am being annoying but my dream of getting the book in people’s hands outweighs my fears of oversharing.